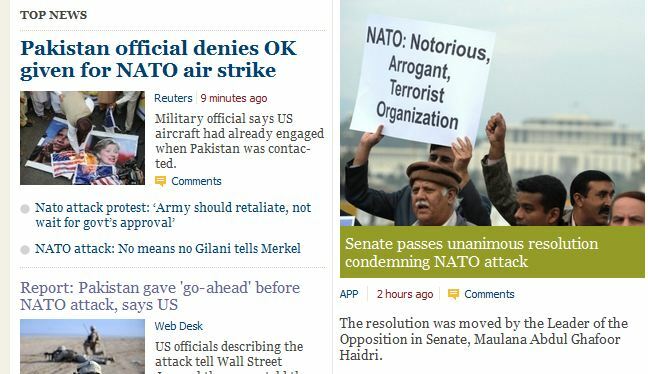 A partial screen-cap of the Express Tribune website on Friday, showing protesters and dominance of the news by the NATO attack. The barrage of claims and counter-claims on what took place early Saturday morning just inside the Pakistani side of the Afghanistan-Pakistan border continues at a rapid pace. On Thursday, the Wall Street Journal published an article in which the US military claimed that Pakistan had given clearance for the attack. Despite the Journal claiming they were unable to get a response from Islamabad for the article, responses from Pakistan did not take long, and Pakistan claims that NATO did not contact Pakistan until after the raid was in progress and that incorrect location information was given in the first contact. The commandos thought they were being fired upon by militants. But the assailants turned out to be Pakistani military personnel who had established a temporary campsite, U.S. officials said. According to the initial U.S. account from the field, the commandos requested airstrikes against the encampment, prompting the team to contact a joint border-control center to determine whether Pakistani forces were in the area, a U.S. official said. When called, the Pakistani representatives at the center said there were no Pakistani military forces in the area identified by the commandos, clearing the way for the Americans to conduct the airstrikes, the U.S. officials said. “Wrong information about the area of operation was provided to Pakistani officials a few minutes before the strike,” said the official, who was not authorized to speak to the media. 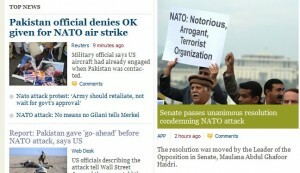 Pakistan’s ISI says one thing NATOs ISAF says the opposite. Two known habitual liars with conflicting stories means we are unlikely to ever know the truth. The first part of the video, shot from the air, shows a fairly large area of a ridge-top that has been burned, presumably from the NATO attack. We also see several established, permanent buildings which fit Pakistan’s description of the Volcano border post. However, when the video switches to footage shot on the ground, we only see things that are more consistent with the US description of a “temporary campsite”. There are shelters which appear to be corrugated metal covering holes dug into the hillside, with the metal covered by dirt and branches. There also is an area of rocks piled together in something that looks like a child’s snowfort, and there appear to be dead bodies in the center of it. Strikingly, in this part of the footage, we see no permanent buildings that would correspond with those seen in the aerial footage. The primary key to understanding just what took place Saturday morning will be to see just how close this “temporary campsite” is to the Volcano border post and to understand why Pakistani troops were there instead of at the established post. It would not surprise me for Pakistan to claim the “temporary campsite” is in fact an outlying guard site protecting the Volcano post. Also, the US could progress to claiming the “temporary campsite” was set up deliberately to evoke a NATO attack. In the meantime, stories continue to fly on how Pakistan is now revising its rules of engagement and how the Pakistani air force was unable to scramble in time to respond to the attack. If this crisis is to be understood and perhaps defused, though, I think that will rest on gaining a full understanding of the “temporary campsite”. It just might, but I’m not sure anyone will believe the truth when [if, more likely] it comes out. The video tends to disprove the Pakistani military claim, and the whole fiasco underscores the need to leave. Also, the video doesn’t explain the communications gap, since we know ISAF officials were in Pakistan for talks, and we know from an incident this week that the comms already in place Saturday could work as designed. But, in the fiasco, the Pakistanis claimed they weren’t able to get through. Message logs could show signal transmissions, it’s probably recorded real-time as well. Did Pakistan call or not? @rugger9: I keep saying that this “accident” was allowed to happen by people within Pakistan that would like to inflame relations with us. @rugger9: I still want to location of the campsite relative to the established post and an explanation of why troops were there. Were all 24 of the deaths at the campsite? That would be good to know, too. I think it is likely that the US did not provide prior notification of their operation given their normal standard method of operation, as well as past “tip-off” results when Pakistan indeed had been notified. I take Pakistan’s response that when finally notified in the few minutes before the strike, the US had provided “wrong information about the area of operation” with a grain of salt. It is more likely that the US provided correct information about the location and that the Pakistanis didn’t place it correctly on their maps. That still leaves the question of why the US airstrikes on geographic locations for Pakistani posts they were supposed to already know about. Given our geolocation technology advantage, the US has much to explain about this. Given our geolocation technology advantage, the US has much to explain about this. And that’s why I think it is so important to know how close the campsite is to the established border post. @Jim White: Though we don’t get a 360 degree viewing sweep from that apparent temporary campsite to identify where both main Pakistani posts are located, you can see at the very end in the video (1:04 of the 1:07 length) a plume of smoke rising from that apparent other distant ridge-line. That says to me that the apparent temporary campsite is sufficient distance away from one, if not both, Pakistani posts to make firing from such a location seem suspicious to the US and a possible Taliban group location. I can understand the US attacking some apparently suspicious outlying temporary campsite that the Pakistanis themselves say might have been firing off a few mortar rounds, a bit of heavy machine gunfire, and a few flares in response to noise the folks at the temporary campsite heard. However, if the smoke plumes identify one or more of the main Pakistani posts, that doesn’t explain the US airstrikes on them unless they were later in the “battle” and perhaps as a result of the folks in the main Pakistani posts “returning” fire against US airstrikes on that temporary campsite. No one is claiming that this did not happen inside the territory of Pakistan, are they? The prime minister said that after the attack, military authorities contacted the border coordination center, where the two sides liaise over operations close to the frontier. The strikes continued, however, and “that relief and reinforcements sent from the nearby Pakistani posts also came under attack,” he said. U.S. officials at the border coordination center later “apologized privately to Pakistani officials for initially providing wrong information and the subsequent engagement of the post without prior information,” he said. This suggests to me that the temporary camp was hit first, then the reinforcements came from the Volcano and Boulder posts and they came under fire. Again, the relative locations of the temp site and the two permanent posts is crucial. Are they all close enough together that the helicopter folks should have known these guys came from the established posts? @MadDog: If it was an honest mistake, what kind of sense does it make not to issue an apology? I agree with the idea that there is intense factionalism in Pakistan, and perhaps someone called in some chips for this. I don’t see how we’ll ever get the facts here. And, since we don’t know who the real friends are, why stay? As for an apology, I can see why the delay as these details come out. However, it would have smoothed over relations, which isn’t going to happen now, because too much rhetoric is invested. So, we’d had enough and someone in Pakistan figured out we’d blast away if we thought these were Taliban. Now, who ordered the temporary camp and why? That might be worth knowing, since that’s why ISAF went after it and then the permanent posts defending their colleagues. It looks like a false flag situation to me. I think one cannot exclude the possibility that the NATO/ISAF ground raiding force that set this thing off were the ones who weren’t exceptionally careful about identifying the location of the site, nor of notifying the multinational border control folks (“they’ll leak” being the justification, I’m sure), more because the raiding force was more interested in getting some kills in, and less about accuracy. And, moreover, because it’s evident to them that continuing and exacerbating the conflict in that corner of the world means continued employment for them doing the killing they like. One cannot also exclude that the site hit was, in fact, an outpost set up by the Pakistani forces and, further, that the force was out of position. This has “dumbass second lieutenant lost at night” written all over it and, speaking authoritatively as a former dumbass second lieutenant, I can see exactly how this kind of thing would happen. Add some troops under his command, spooked by both his ineptitude and being out on the edge of the spear at night and alone, making up for their being spooked by launching bullets and whatever at anything they perceived as a possile threat, regardless of whether the threat was real or not or whether what they perceived as being out there was real or not. In other words, the Pakistanki troops were probably shooting wildly at ghosts – something that went bump in the night – probably just rocks making noise as they tumbled down the mountainside having been loosened by erosion’s forces during the day, without any human involvement at all. In sum, a series of dumb, stupid mistakes that probably didn’t look like such when they were undertaken nor which, in isolation, would have been so catastrophic. But, when strung together, 24 people died and two nuclear powers waving their swords at each other in earnest. There was a few days of back-and-forth and before it was all said and done, a bunch of US troops at a major training area near the Czech border (about 30 miles inside Germany) were treated to a display of real-live aircraft identification as a flight of Soviet MiGs went over at low altitude and with afterburners set at “maximum noise”. All while they were compelled to stand there, watching, and do nothing in response. Things quieted down after that. It doesn’t bloody matter where the Pakistanis were, as long as they were inside Pakistan. They can go camping or even skinny dipping without asking permission of 3mpyre. Doesn’t this read like a nifty, well-timed Taliban provocation operation in lets-you-and-him-fight style? Throwing a bunch of hapless Pakistani regulars under our folks, jumpy from watching their boss get slapped down for trying to speak truth to politics, and dare we suggest it, fed some misleading intelligence? Abetted by a sympathetic Pakistani officer or two in the communications channels. Initiated by a jihadist suicide squad loaded up to sound like a battalion. I say give the Chinese a chance to apply their methods. Might take their attention away from Tibet, anyway.